Adhi– a white and purple/red shawl for meditation, a symbol of respect for the spiritual practice. Bodhicitta– the enlightenment attitude – the resolve or intent to attain enlightenment of a Buddha for the benefit of all beings, not just oneself. Bodhisattva – one worthy of nirvana who postpones it to help others. Buddha– “Awakened One.’ A Buddha is a person who is completely free from all faults and mental obstructions. The Buddha who is the founder of the Buddhist religion is called Shakyamuni Buddha. Buddhism – the teaching of Buddha that life is permeated with suffering caused by desire, that suffering ceases when desire ceases, and that enlightenment (obtained through right conduct, wisdom, and meditation) releases one from desire, suffering, and rebirth. Chenrezi – the Bodhisattva of Compassion. Dharma – the teachings of Buddhism. Enlightenment – A blessed state in which the individual is free from suffering, understands the nature of the mind and reality, and enjoys complete bliss, delight, and peace. The causes of enlightenment are: great compassion, wisdom (the realization of emptiness and insight through one-pointed calm abiding meditation), and the accumulation of great amounts of merit and wisdom. Four Immeasurables– 1) Loving kindness. 2) Compassion. 3) Appreciative or sympathetic joy. 4) Equanimity. Four Noble Truths: 1) The noble truth of suffering (and stress). 2) The noble truth of the origin of stress and suffering. 3) The noble truth of the cessation of suffering. 4) The noble truth of the way of practice to cease suffering. Insight– the right discernment of all phenomena, whether external or internal, material or spiritual. Lama– in Sanskrit “guru,” a teacher, someone important for the student. Katag – a white scarf, symbolizing purity, offered a Lama as a “good wish” or at a ritual. Mala – a string of beads for keeping track of how many mantras you have recited. Mantra – a sacred word or syllable repeated in prayer or meditation. Merit – the purification of past unwholesome deeds and the attunement of the mind to the stages of holiness by training in the “Six Perfections,” i.e., giving (generosity), moral conduct, patience, diligence (enthusiasm for performing virtuous deeds), meditation, and the perfection of wisdom. Retreat – a special time of solitude and silence to engage in reflection, meditation, personal renewal, and spiritual practices (e.g., the Four Preliminary Practices). Sangha: Bodhisattvas, Tulkus, Lamas, monks, nuns. Six Perfections: Generosity; morality, patience, diligence/persistence, meditation/concentration, wisdom/mindfulness. Six realms of existence: Hell realm, hungry ghost realm, animal realm, human realm, demigod realm, god realm. Tantra – the esoteric (secret) teachings of the Buddha. 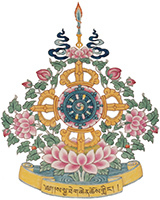 The Three Jewels – the Buddha, the Dharma and the Sangha. Tsok – an offering such as food, flowers, incense, candles or money. Tsok Kor – a prayer service whereby we make offerings of foods, flowers, incense, etc. Vajrayana – comprehensive set of spiritual practices that utilize the body, voice and mind to most quickly attain Buddhahood (enlightenment).